Flyer by Lenoi Tiffany, courtesy Harriet’s Apothecary. 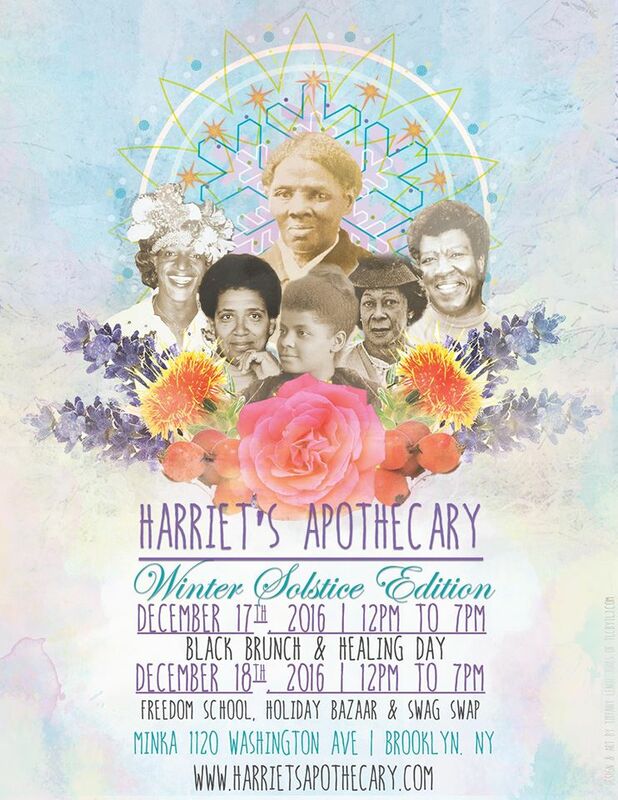 Harriet’s Apothecary is an intergenerational healing village consisting of an all black team of cis-women, queer, and trans people. Following in the legacy of abolitionist healer Harriet Tubman, their work is a contemporary manifestation of the Underground Railroad. Three members of the twenty-two member Harriet’s Apothecary family came together to share their practice with us on June 1, 2016 at The 8th Floor in New York. Adaku Utah is an artist, healer, and founder of Harriet’s Apothecary who was a 2015 ABOG Fellow for Socially Engaged Art. Naimah Johnson is a New York State licensed therapist with a radically integrated therapeutic approach. 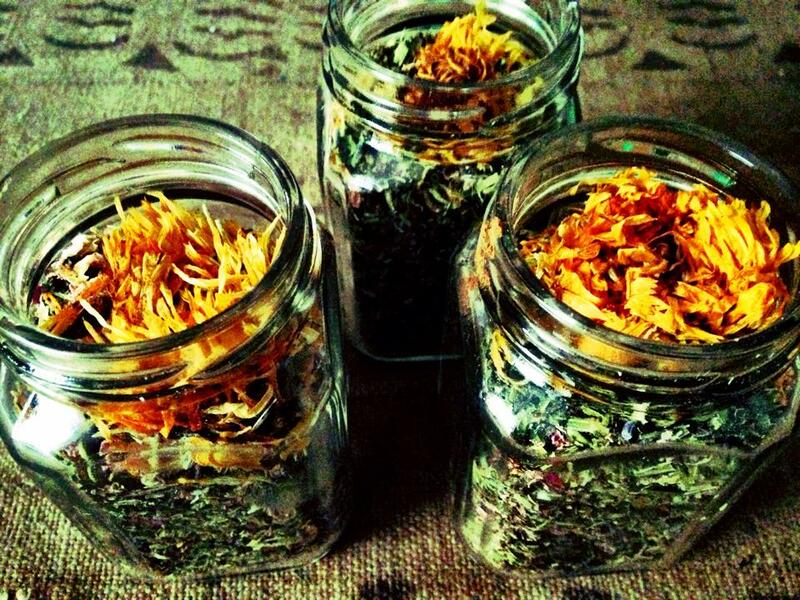 Natalie Sablon is a nurse dedicated to herbal wellness. Their conversation was moderated by Deborah Fisher, ABOG’s Executive Director. An edited version of the conversation is below. Audio of the entire dialogue, including the opening and closing guided grounding practice, is available here. After an opening grounding practice led by Naimah Johnson, Adaku Utah began with a brief presentation introducing Harriet’s Apothecary. Adaku Utah (AU): We are in a fight for people’s lives. Particularly for black, Indigenous, and people of color within our world where we’re constantly interfacing violence ridded in racism, and sexism, and ableism, and transphobia. We want to resist that and reclaim the capacities of our bodies to be healers and warriors and resilient. We want to do that for our movements committed to fight for social justice. Harriet’s Apothecary Summer Edition, MINKA Brooklyn, July 2016. Photo: Angela Hill, courtesy Harriet’s Apothecary. One of the main ways that we show love, build community, and lift up liberation is through our healing villages. They are comprised of three main parts. One: we offer free to low-cost healing services, one-on-one sessions, that range from practices rooted in Indigenous lineage and knowledge from the diaspora. They also are connected to things learned from grandmothers in the present day. Two: we do group sessions that support folks in coming together, really seeing each other and dreaming together. We’ve had sessions cultivating a self-care to transform internalized oppression, sessions in creating flower essences around dealing with grief, and in creating potions that support your sensuality and sexuality. A lot have some level of political analysis and deep connection to the heartbeat of our community. 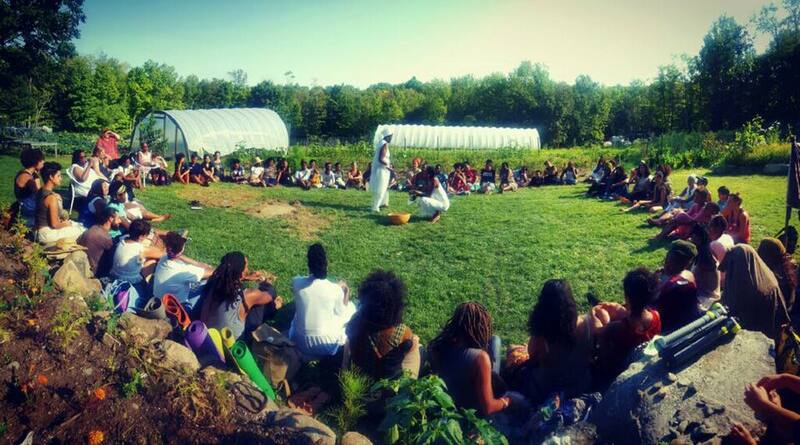 Three: Freedom School is a response to the community wanting to have more intentional spaces to learn and deepen internal healing powers. How can you amplify those healing powers? We created these Freedom Schools that mimic Freedom Schools that existed during the Civil Rights Movement – they’re led by community members and are rooted in engaging communities and enhancing what makes them feel the most free. We show love, build community, and lift up liberation. We do a lot of training and consulting throughout the country, particularly working with social justice organizations to support them in integrating a healing justice framework into their organizing strategies. We recognize that folks who are on the frontlines are dealing with different types of trauma. We do trainings that center art, spirit, and a critical political analysis to support folks in integrating healing and moving through conflicts, in building community, and helping people dream. Because our work is so intergenerational, we create opportunities for young people, specifically high school youth, to engage in their own leadership and their own healing powers. We have young people who work alongside us in co-creating our healing villages and doing trainings with us across the country. 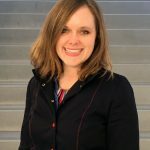 Deborah Fisher (DF): How did you start working together? The fact that you are a collective is fundamental to your work. Natalie Sablon (NS): I have been in Brooklyn for four years. Two years ago Adaku put a post on Facebook about this amazing village, something that was new, and I was very interested. I asked around about her because we have mutual friends. Finally we spoke and I volunteered. The running undercurrent in Harriet’s Apothecary is this deep trust. I was transitioning from my very western practice as an RN. I started taking herbal classes. My life was in flux and transition. Things needed to merge, my life needed to be more authentic. I saw this as a step in the direction of authenticity. Also it is serving the population that I’ve always been in love with and wanted to give my best to. DF: Why did you get involved, Naimah? 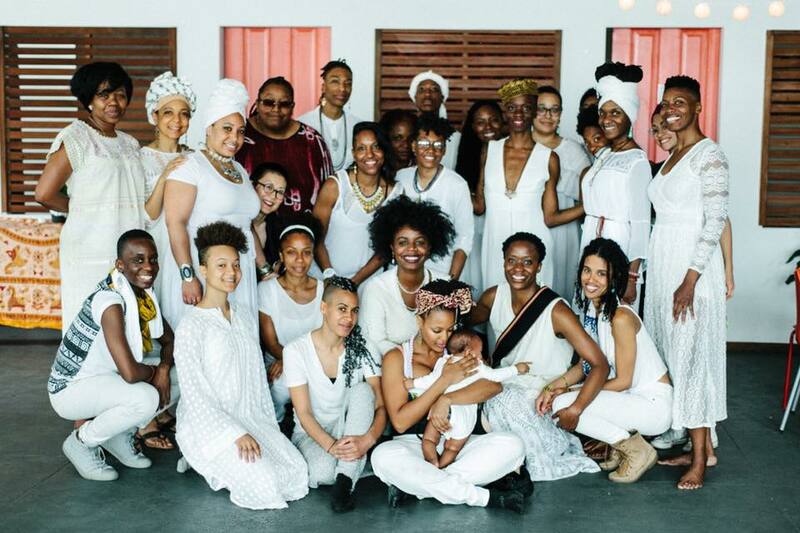 Naimah Johnson (NJ): Adaku and I had been sharing space, doing healing work and community building at Black Women’s Blueprint. We had a lot of conversations about issues or needs that were falling through the cracks. We still felt like we needed to give more and do more and be able to reach a wider group of folks and really provide the most inclusive and accessible opportunities for healing. Natalie was actually the very first face that I saw when I walked in the door for the first Apothecary. She was just so loving. It felt like family from the moment I walked in, like we had an ancestral call to answer. We were pretty unrelenting in keeping that conversation going and making sure that our community knew that that call was being answered. We dreamed together and the healing cipher experience came out. It became my intentional offering, and has shifted, and expanded, and become available to more and more folks at the village. DF: Can you describe it? What is the healing cipher? NJ: It’s a little different each time, but it’s very much in line with breaking down hierarchies. I call it a cipher because I don’t sit in the front and facilitate a process as much as I invite everyone into an exchange and to offer a reflection, some vulnerability, some space of resistance, some space of revolution that they want to create or co-create or open up in their world. Then, we get to dream and envision what that can look like. With consideration of all the structural issues that we’re up against, all the different forms of oppression that lean in the external world as well as in the internal world that a person’s walking with each and every day. DF: One of the interesting things about Harriet’s Apothecary is the way that you are bringing the notion of healing and self-care together with the idea of political resistance. Can you go into how that is manifested a little bit more? AU: It manifests itself in a number of different ways. At the heart of it is supporting organizations and collectives and really aligning vision with actual practice. What we do is we begin with a lot of deep listening. Finding out where do the strengths lie? What is the legacy of this work? What are they moving? What are their hopes and dreams? Who is the community that’s at your center? What are you hoping to shift? 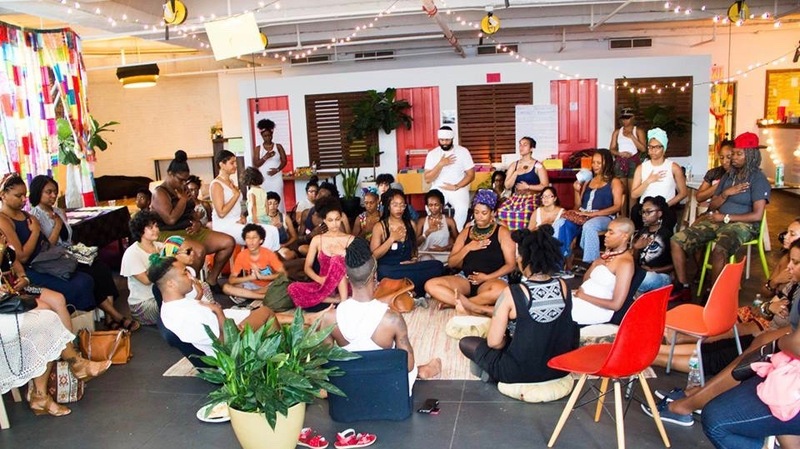 I think that’s necessary because we can’t just go in and say: “this is the formula for y’all to follow.” There’s a lot of deep listening to cultivate the best practices and the most intentional rituals, campaign development, strategy development, conflict transformation that could work with this particular organization, community, or space. We cannot have a revolution if we have burnt out revolutionaries. Throughout that process, there’s a lot of deep checking in to see how it this working. We’re honest with the people that we work with. We don’t believe in sugar coating reality because that, too, in itself is an act of violence. We bring a rigorous level of honesty into our work and a loving push into a direction that people are meaning to go towards. Let us support you. I think one of the ways in which oppression rears its head in organizations is that we either don’t want to be wrong, we don’t want to be bad, we don’t want to be racist, and so we lie; or we overcompensate and we don’t have boundaries. Harriet’s Apothecary Brooklyn Museum Edition, March 2015. Courtesy Harriet’s Apothecary. NS: One of the ways that we maintain a just practice and we continue to elevate anti-oppressive theory in our work is to not assume that we are experts and to center and elevate the most marginalized communities so that their voices are added to the conversation. Specifically our trans community, our immigrant communities, and our Indigenous communities. Folks who’ve never had a seat at the table. Who have brilliance, and a legacy of wisdom and resistance that they can add. They can move things once their voice is added. 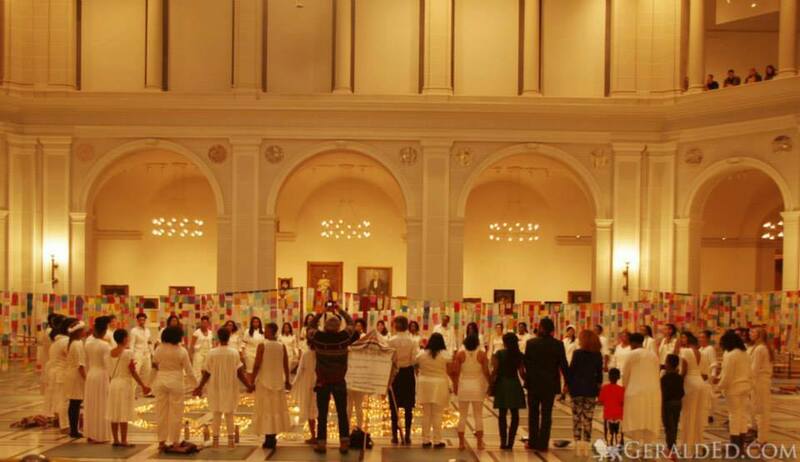 NJ: Healing is a revolutionary act. It’s a sign of the times. Our movement doesn’t look the way it did back in the sixties. Organizations like Black Lives Matter are creating revolutionary way of healing human lives and are led by queer, black women. I think that as our movement is shifting and women have a way of leading, we have a way of incorporating a holistic way of being. We cannot have a revolution if we have burnt out revolutionaries. 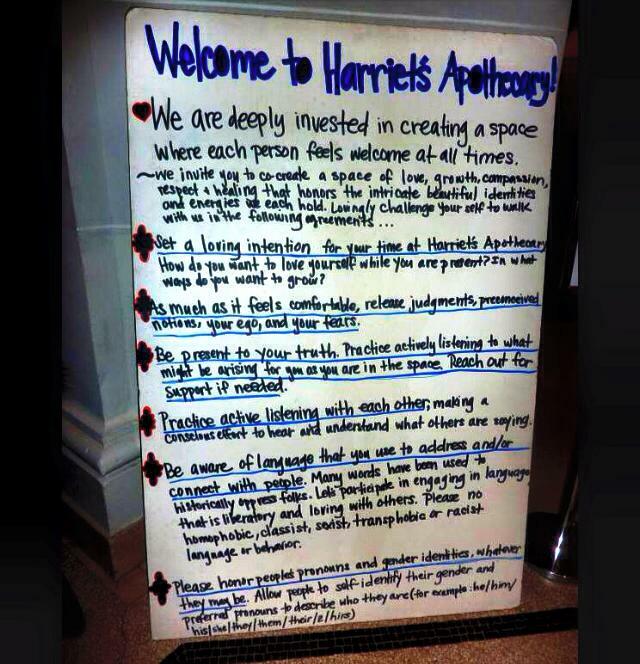 Harriet’s Apothecary holds regular healing sessions & other events in New York—learn more on their website. They have also created an extensive compilation of healing justice resources to guide your own practice.